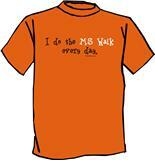 I do the MS Walk Every Day in an orange tshirt with a white and black imprint. The NMSS made orange our color so let's paint the town ORANGE and let's find a cure. 100 % cotton preshrunk Gildan Tshirt.